PA leader refuses to meet with EU delegation and explain use of EU aid, amid suspicions that the funds are going to pay terrorist salaries. 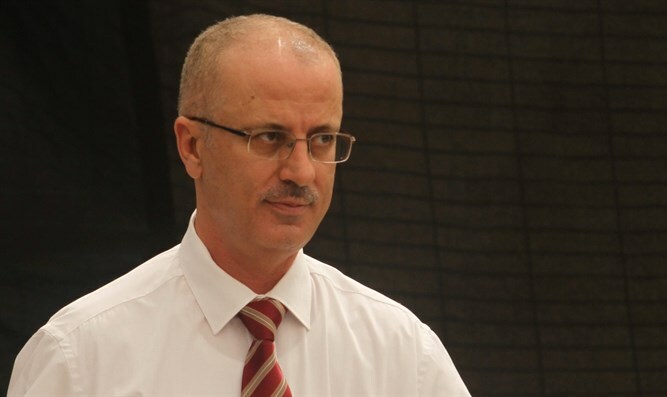 The European Union is angry at Palestinian leader Rami Hamdallah, after he refused to meet with a delegation of senior EU officials during its visit to the Palestinian Authority this week, Kan reported. EU officials said following the incident that the EU was dissatisfied with Hamdallah's performance and the contempt he displayed towards the delegation. The delegation is headed by Christian Danielsson, responsible for the Middle East in the European Commision and for funds transferred to the Palestinian Authority, as well as the European Union's foreign affairs managing director Fernando Gentilini, who served as EU envoy for the peace process. Hamdallah's refusal to meet with the delegation comes after the demand by the two officials that Hamdallah give explanations about the use of EU funds, amid suspicions that the PA is using EU funds to make payments to terrorists and their families. MK Elazar Stern (Elazar Stern) views the European move as a continuation of the Australian government's decision to stop aid payments to the Palestinian Authority due to the PA's refusal to detail the uses made of the payments and the suspicion that the payments are funding terrorists’ salaries. Stern believes that this step also stems from the legislation of the "Pay to Slay Law" he initiated together with MK Avi Dichter (Likud). "Today I believe even more that the law will reduce terror and save lives," he said.